One of the aspects of Montessori that I like the most is that we offer limited, beautiful and purposeful activities for our children even at a young age. Selfishly, this means my house doesn’t feel ‘taken over’ by toys- which, as someone who has post-partum OCD and anxiety, I deeply appreciate! This is the tiny playroom we made out of a storage closet. Enough space for everything she needs! Noora has a small shelf in her bedroom that I’ll show in a later post, but for now I’d like to focus on her playroom. We live in a very small townhouse, but we are blessed to have a large storage closet next to her bedroom- and as we don’t have a lot to store, we were able to repurpose it as a playroom. 1) A basket of Schleich animals; currently farm animals, though she has other Schleich animals in other baskets around the house. These aren’t cheap, but the quality of moulding and painting is worth it to me. The quality of Schleich animals makes them a favourite of classrooms and homeschools all over. The detail on them is astonishing. 2) A basket of sound blocks. Noora loves these and each features a different ‘filling’ and accompanying sound. 3) A basket of balls- including perpetual favourite sensory balls; a knit ball; a felt ball, and more. Noora used to mostly mouth on these, and now is heavily into a dumping phase- she’ll spend long periods taking out and putting the balls away. 4) Stacking cups. This has never diminished in excitement for her- it has been a consistent favourite since about 7 months. All the expensive, organic, natural wooden toys and her favourite are $6 plastic cups. Obviously. 5) A peg and cup- the next step from the egg and cup, this work helps Noora refine her grasp. It’s from one of our favourite Montessori stores on etsy! 6) A single shape puzzle. The single shape makes for a puzzle even a young child can do with success. Currently we have the large circle puzzle out. Mine are from ebay; they were much cheaper than the most common kind and I’m very happy with the quality. 7) A xylophone. Noora received this high quality, lovely sounding instrument for Christmas and has been in constant use since. 8) A shelf of books. We have books in every room Noora is in. While Montessori advocates for books based solely on realism and reality at this stage, with no fantasy, this is where I deviate a bit. We definitely have Star Wars baby books and I’m not going to pretend otherwise! That’s it!. We have a foam tile mat on the floor and a large wall-mounted mirror. In the back we have a toy box full of all the stuffed animals that seem to accumulate when you have a child (every other gift ever!). 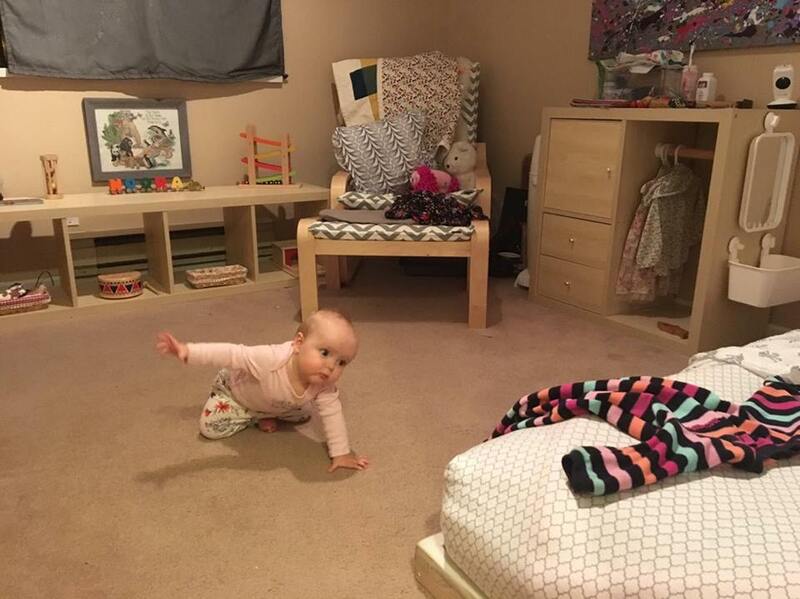 While she has a shelf and areas in our bedroom, the living room and her bedroom for toys, this is her primary and largest play area.